When planning family travel, we envision the rich culture and abundant history that will make a lasting imprint on our teens and give them a broader perspective on the world and society. Ambitious yes, realistic…probably not unless you factor into your travel planning activities and an agenda that your teen has a stake in. For anyone who has ever been to Vatican City, no matter what time of day or season, you have to know that the lines to get inside the sacred walls are always crazy. If you’re anything like me you loathe waiting in line and the thought of getting up at ridiculous hours just to wait is definitely not an option. In fact, one of the first things I look for when traveling is how to skip the lines for the more popular attractions. 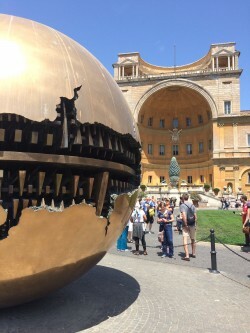 Here are tips on how to tour the Vatican museum and Sistine Chapel without waiting in long lines. Pizza reigns supreme as a perennial favorite any time of year and just about any time of day! Here’s a brief primer on “pizza al taglio” literally translated as “cut pizza” as in, by the slice.